We believe in Pet Happiness. Our professional pet sitters know exactly how to hold and care for your rabbit while you are away. Thinking About Hiring a Rabbit Pet Sitter? Are you going away on vacation or business trip and can’t take your rabbit with you? No problem. At Trusty Tails, we love taking care of rabbits, so much so, that many of us have rabbits of our own. Our professional pet sitters know exactly how to hold and care for your rabbit while you are away. Our professional, caring rabbit sitters are here to provide food, play and a clean environment so you can enjoy your time away. Customized visits to fit the needs of your rabbit and maintain your pet’s routine. Fresh food (pellets, hay lettuce, etc) and water, scoop/change litter, brushing if needed, give medicine, and lots of love. Supervised playtime (we know they can chew on things they shouldn’t), letting them out of a pen or cage to hop around, play with toys and games. We stay as long as it takes to make sure your pet is cared for and loved properly, but typically, visits are typically 20-30 minutes. Upon completion of the visit, a GPS time stamped map, pet care journal and photos are emailed to you. Schedule a Quick Phone Consultation Get Started with Rabbit Care & Register Now! 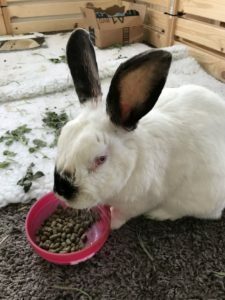 How Much Does a Rabbit Pet Visit Cost? *Prices subject to change. Additional fees may apply.